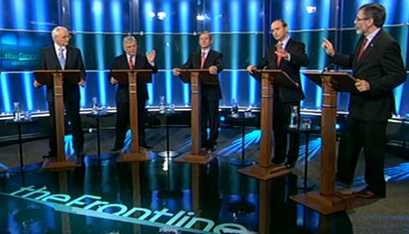 Election Debates has scored the Second Irish Leaders’ Debate of the 2011 election 2-0 to Enda Kenny (Fine Gael). The debate was a five-way debate, involving Mr Kenny, Micheal Martin (Fianna Fail), Eamon Gilmore (Labour), Gerry Adams (Sinn Fein) and John Gormley (Greens). The debate was hosted by Pat Kenny of RTE. Over the course of 90 minutes, members of a live studio audience questioned the speakers. The questions covered issues such as job creation, emigration, mortgage relief, healthcare, budget cuts and political debate. Colm Flynn and Ray D’Cruz judged the debate for Election Debates. To read their scores and analysis in full, scroll down or click on the links below. If you missed the debate, you can watch it here.